it may, upon a request being made, authorise, even without the agreement of the owner of the patent, authorise a Government agency or a third person to exploit the patented invention. This provision ensures that the government can use generic medicines in case a patent holder sets high prices for branded medicines. Although the state has been compliant with the Doha Declaration, one major drawback is that the legal and institutional frameworks do not provide for the protection of economic, social and cultural rights. The Constitution of Mauritius, the supreme law of the land, has no provisions for the protection of the right to health. This concern has also been expressed by the Committee on Economic, Social and Cultural Rights (CESCR) in its concluding observations during the consideration of reports submitted. It is also important to highlight that the ICESCR’s provisions have not been incorporated in the national laws and cannot therefore be invoked before the national courts. Furthermore, the National Human Rights Commission has no specific mandate to deal with economic, social and cultural rights and there is no National Medicines Policy document. Provision of free essential medicines in public hospitals does not ensure that those medicines are accessible to everyone. For example, children living with disabilities or children living with HIV/AIDS cannot travel to the public hospitals to collect medicines and there is no such policy whereby essential medicines should be made available to persons who are in need of them. 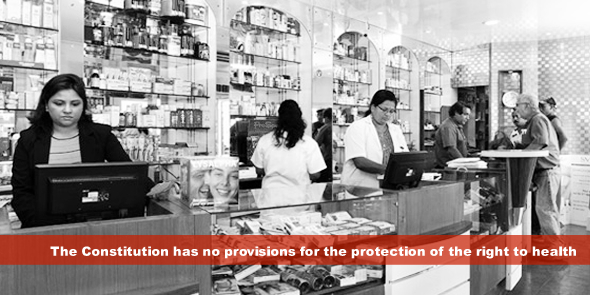 Moreover, there are some instances where there is discrimination while providing for essential medicines. One such example is the opioid substitution therapy which includes age barriers for the provision of methadone to drug users. The right to health can be inferred from the right to life as had been in countries such as Costa Rica and India. An analysis of Mauritian case laws depicts that the Supreme Court has not had the opportunity to tackle an issue concerning the right to health which required the interpretation of the Constitution. The concept of implicit rights has, till date, been unknown to the Mauritian judiciary and as such there is no guarantee that the Supreme Court will positively interpret the right to life to include the right to health. The inclusion the right to health in the Constitution will render the right justifiable and the population will have a better basis to bring cases to court in the event of them being deprived from the right to access essential medicines. The cases of Patricia Ochieng, in Kenya and that of Treatment Action Campaign in South Africa demonstrated how a justiciable right to health can protect the right to access essential medicines. The government should therefore give effect to the recommendation of the CESCR and bring about a constitutional amendment which will include economic, social and cultural rights in the Constitution thus making the right to health justiciable. After including the right to health in the Constitution, the government should adopt a new legislation to protect the right to health of all the citizens. This new legislation should compile the national health policy and the plan of actions. This new legislation should clearly set access to medicines as a component of the right to health. To avoid any foreseeable problem, the use of generic medicines should be included in the act and there should be a clear demarcation between generic drugs and counterfeiting so that it does not limit the access to medicines of Mauritians. In the shorter term, it is also being proposed that members of civil society attend workshops on access to medicines and the right to health. These persons can disseminate the information they have gained during the workshops to sensitise people about the importance of the inclusion of the right to health in the Constitution. They can then engage the government in debates concerning the amendment of the Constitution to include the right to health as a fundamental right. Ashwanee Budoo is a full-time candidate for the Law Practitioners Vocational Course in Mauritius. She completed her LLM (in Human Rights and Democratisation in Africa) with the Centre for Human Rights, University of Pretoria in 2012. She is also a part-time lecturer at the University of Mauritius. Thanks, Ashwanee, for your contribution. I learned that Mauritius is one of the few countries that does not recognize the right to health in their constitution. You mentioned about Mauritius’s ratification of the global and regional instruments that guarantee the right to health. Under English law international law is part of domestic law and is directly applicable. What is the status these instruments under Mauritius’s constitution? Can courts in Mauritius invoke the instruments for deciding cases?